Australia-based biNu, a mobile startup that brings smartphone-like experiences to ‘dumb phones’, has closed a $2 million round of Series A funding which included participation from Eric Schmidt’s TomorrowVentures and private investors in the US and Australia. The 18-month old firm, which is based in Sydney, is focused on bringing an app-centric experience to feature phones and low-end smartphones the world over, although it is particularly focused on Asia, Africa and other emerging markets. 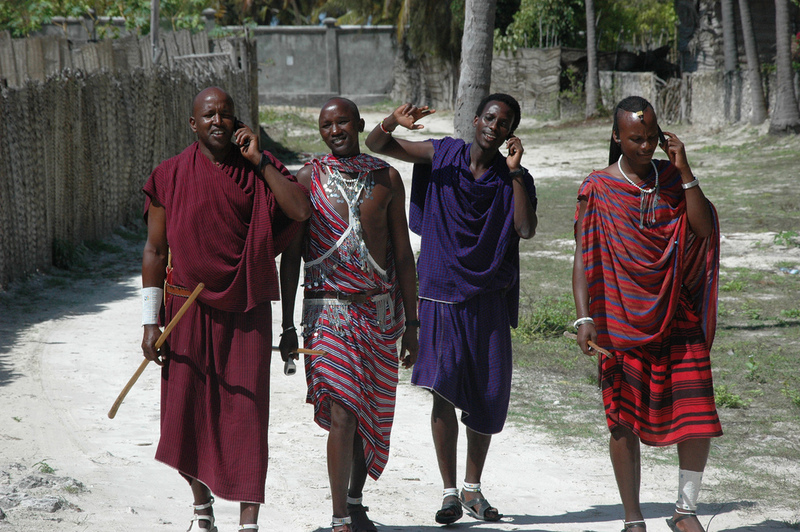 Despite fast growing smartphone sales, feature phone account for the lion’s share of devices worldwide. A Vision Mobile study put smartphones at just 27 percent of all devices on the planet, as of November 2011. BiNu’s platform hosts apps in the cloud and can be downloaded to Web-enabled ‘dumb’ phones and low-end smartphones as well as, interestingly, any Android-powered device. The platform hosts a range of apps and Web-based services — including all the usual suspects like Facebook and Twitter — giving users full access to services through one ‘door’. For users in developing markets, that’s a huge draw and, to date, biNu has 4 million monthly users and is growing at a rate of 400 percent, co-founder and CEO Gour Lentell tells us. Information is knowledge, and these days the Internet has become a global fountain of wisdom. Yet, those with plain feature phones have a tough time accessing it, and that’s a key aim for biNu, according to Lentell. “Steve Jobs changed the world with apps, previously it was WAP and mobile-browsers but that was never taken up beyond a small base. Today, apps are a fantastic way to access content and information,” he says. Meanwhile, the company is preparing new features and support for new apps to further enrich the experience of biNu. Right now the service is particularly strong in Asia and Africa, having grown massively in the latter continent over the last nine months. India remains one of its biggest markets, while uptake has been brisk in Nigeria (which has 500,000 registered users alone) as well as Ethiopia, Zimbabwe, Kenya, Tanzania and others. Latin America is also showing positive signs of increasing usage, Lentell says, and it is one regional where the company is keen to expand its presence and offering. Thanks to the fact that Google Translate runs through the app on the (cloud) server side, localization is no issue since users can selected their language of choice. With its focus on emerging markets and efficient use of bandwidth — which is ideal for pre-pay mobile users who are billed exactly by their usage — biNu is very much like browser firm Opera, which recently passed a colossal 200 million monthly active users. 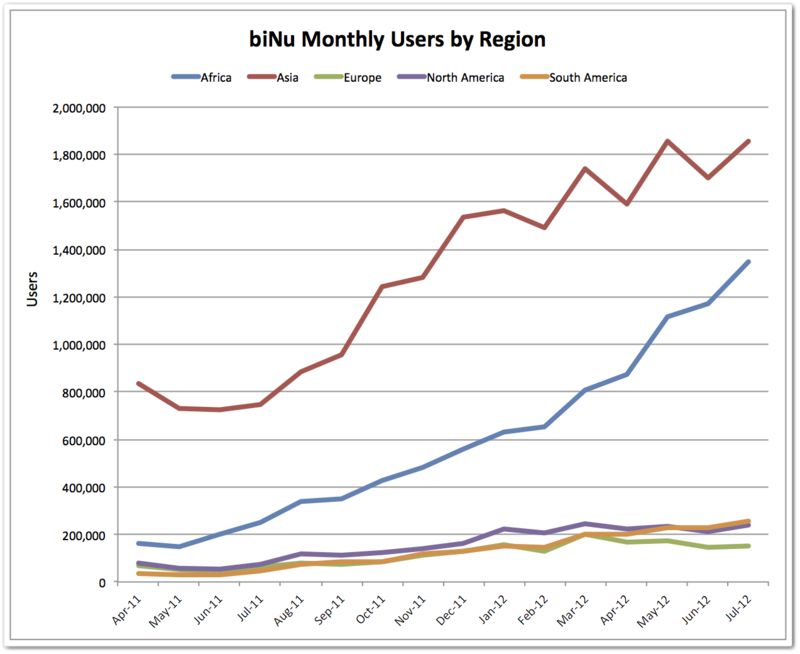 However, despite similar goals, biNu is taking a distinctly different approach to Opera as it aims to reach new users. Opera uses high volume distribution deals — it recently partnered with America Movil and Bharti Airtel, which boast a combined 500 million users — but biNu is taking a more independent route, using a social strategy to grow. As part of its service, the company has created its own social network. This allows those who have installed biNu to communicate with each other, and share information — such as recently read stories — across a number of services, although the social feature was not initially available on launch. This social layer is driving new user growth at impressive rates, Lentell says, and it remains one of the most used features in many regions. 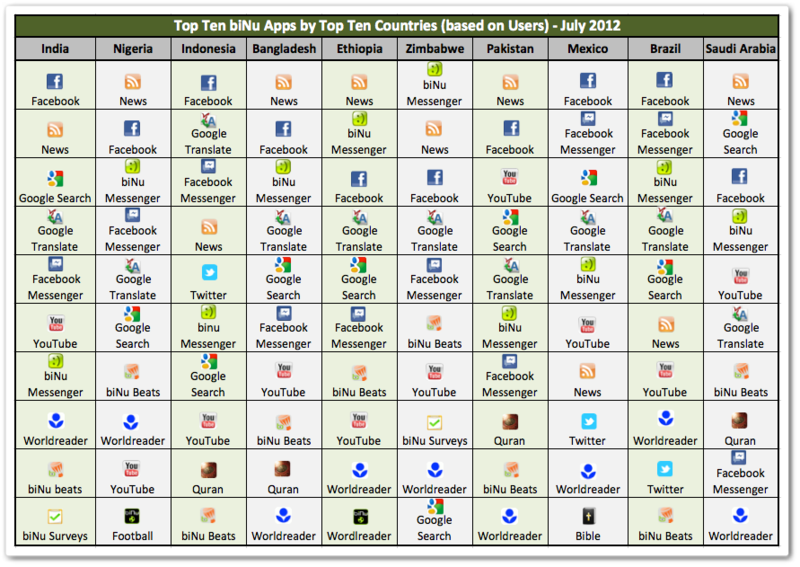 BiNu’s social feature remains popular thanks to its benefits over Facebook and other services that have been optimised for low-end devices. Facebook acquired Snaptu in 2011 to fine-tune its feature phone offering, yet it still has limitations. Instead, using Binu, users can post information to Facebook direct from the service, while using it to access any number of sites and other apps with speed. When it comes to monetisation, the company is looking into a couple of options. It has its own virtual currency — binucredits — that enables transactions on the service, while Lentell says the company is talking to market researchers who are keen to find an avenue to reach emerging market-based consumers. Equally, biNu plans to open its platform to developers in due course. Such a move will allow local developers to monetise their apps through the service and provide more localised options for users, Lentell says. It is probably rash to say that biNu is the kind of company that Facebook could look into acquiring but, with the social network is said to be casting its eye on Opera, as it seeks emerging market traction, it isn’t hard to see that biNu would bring benefits. Regardless of any outsider interest, Lentell says that the company is just focused on doing its own things and ramping up its offerings to users. Further funding is likely to be sought “sometime next year” to help the company realise its ambition of bringing the work Steve Jobs and Apple has done with apps to the masses. If you want to see what the biNu experience is like and don’t have a feature phone handy, the firm has an emulator on its website here.